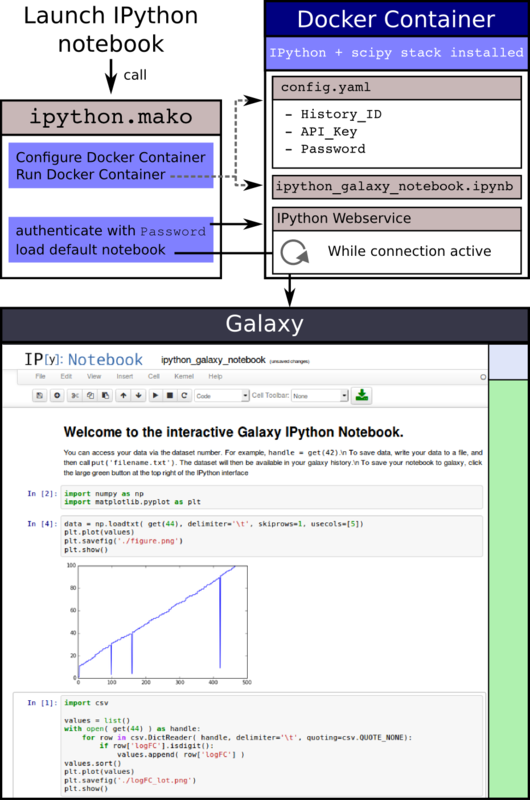 A GIE is a Docker container, launched by Galaxy, proxied by Galaxy, with some extra sugar inside the container to allow users to interact easily with their Galaxy histories. A GIE is primarily composed of a Docker container, and the Galaxy visualization component. Galaxy vizualisation plugins are rendered using Mako templates and Mako templates in turn can run Python code. GIEs build upon visualization plugins, adding features to allow for container management and proxying. This Python code in the Mako templates is used to launch the Docker container within which a GIE runs. Once this container is launched, we notify a proxy built into Galaxy which helps coordinate a 1:1 mapping of users and their docker containers. Deploying GIEs is not a trivial operation. They have complex interactions with numerous services, you’ll need to be a fairly competent SysAdmin to debug all of the possible problems that can occur during deployment. After the initial hurdle, most find that GIEs require little to no maintenance. An Ansible role for installing and managing GIEs can be found on Github and Ansible Galaxy. Currently the Galaxy proxy is a NodeJS+Sqlite3 proxy. Node has recently upgraded, and our proxy is pinned to an old version of sqlite3. As such you’ll currently need to have an older version of Node available (0.10.X - 0.11.X vintage). We’re working on solutions in this space to provide a better deployment mechanism here and fewer dependencies. Please note that if you have NodeJS installed under Ubuntu, it often installs to /usr/bin/nodejs, whereas npm expects it to be /usr/bin/node. You will need to create that symlink yourself. where GALAXY_ROOT is the location of your Galaxy installation and GALAXY_USER is the username of the user that Galaxy runs as. The first option says that you have Galaxy and the Galaxy NodeJS proxy wrapped in an upstream proxy like Apache or NGINX. This will cause Galaxy to connect users to the same port as Galaxy is being served on (so 80/443), rather than directing them to port 8800. The second option is closely entertwined with the first option. When Galaxy is accessed, it sets a cookie called galaxysession. This cookie generally cannot be sent with requests to different domains and different ports, so Galaxy and the dynamic proxy must be accessible on the same port and protocol. In addition, the cookie is only accessible to URLs that share the same prefix as the Galaxy URL. For example, if you’re running Galaxy under a URL like https://f.q.d.n/galaxy/, the cookie is only accessible to URLs that look like https://f.q.d.n/galaxy/*. The second (dynamic_proxy_prefix) option sets the URL path that’s used to differentiate requests that should go through the proxy to those that should go to Galaxy. You will need to add special upstream proxy configuration to handle this, and you’ll need to use the same dynamic_proxy_prefix in your galaxy.yml that you use in your URL routes. In the examples below, we assume that your Galaxy installation is available at a URL such as https://f.q.d.n/galaxy. If instead it is available at a URL like https://f.q.d.n, remove the /galaxy prefix from the examples. For example /galaxy/gie_proxy would become /gie_proxy. Remember that gie_proxy is the value you use for the dynamic_proxy_prefix option. If you use a different value in that option you should change the examples accordingly. # Project Jupyter specific. Other IEs may require their own routes. Please note you will need to be using apache2.4 with mod_proxy_wstunnel. If you proxy static content, you may find the following rule useful for proxying to GIE and other visualization plugin static content. You might want to run your IEs on a host different to the one that hosts your Galaxy webserver, since IEs on the same host as the webserver compete for resources with that webserver and introduce some security considerations which could be mitigated by moving containers to a separate host. This feature has been available since 15.07 and is used in production at the University of Freiburg and on usegalaxy.org. So far so good! Note, however, that unless restricted by a firewall, this mode of operation is insecure, as any client could connect and run containers on gx-docker. If this is a concern at your site, follow the instructions in the Docker documentation to Protect the Docker daemon socket. Please adapt your command as needed. The Jupyter GIE supports getting and fetching Galaxy history datasets entirely through the Galaxy API so it is not necessary to share a filesystem with gx-docker. However, other GIE plugins may still require this. This will let Galaxy and the Docker host share temporary files. As of Docker Engine version 1.12, Docker Engine can be configured to provide a cluster of Docker Engines in a configuration known as Docker Engine swarm mode. This replaces the previous and similarly named Docker Swarm clustering solution, which is not compatible with swarm mode. The Docker Engine swarm mode documentation fully explains the differences, but the major difference is that whereas under Docker Swarm one could run commands on the swarm with docker run, Docker Engine swarm mode requires one to create persistent services with docker service create and to remove those services once no longer in use with docker service rm. You can also enable swarm mode for all GIE plugins by setting interactive_environment_swarm_mode in galaxy.yml to True. If using this setting, you must still set docker_connect_port in each GIE plugin’s ini configuration file. The swarm_mode setting in individual GIE plugin config files will override the value set in galaxy.yml. Note that your Galaxy server does not need to be a member of the swarm itself. It can use the method outlined above in the Docker on Another Host section to connect as a client to a Docker daemon acting as a swarm mode manager. Once configured, you should see that your GIE containers are started and run as services, which you can inspect using the docker service ls command and other docker service subcommands. Galaxy will start a “swarm manager” process when the first swarm mode GIE is launched. You can control this daemon with the config file config/swarm_mode_manager.yml. Consult the sample configuration at config/swarm_mode_manager.yml.sample for syntax. It will automatically shut down when no services or nodes remain to be managed.